In honor of the upcoming Academy Awards, this month’s recipe redux theme is “Oscars in the Kitchen.” We were asked to re-create a recipe from our favorite food scene or featured dish in a movie. The timing couldn’t have worked out any better because about a week prior I found myself watching the animated film, Ratatouille where a rat doubles as a culinary whiz with aspirations of becoming a Chef. In the movie, he teaches his friend, a kitchen worker at a famous restaurant, how to make the traditional French dish, ratatouille. Truth be told, I’d never made this classic dish before. Traditionally seen in the summer when veggies are in season, it tasted like a nice hearty vegetarian meal for a cold winter’s night. 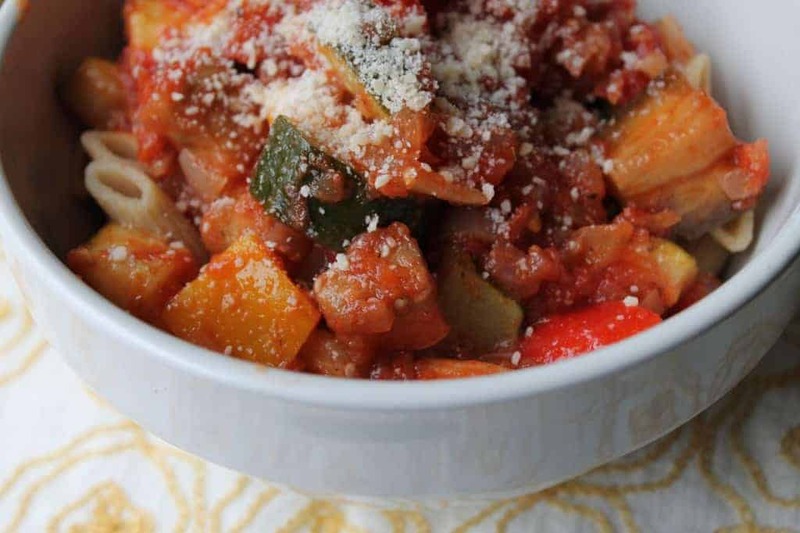 Ratatouille is often enjoyed as a side dish but can be a main vegetarian dish when paired with rice, pasta, or crusty bread. Preheat oven to 350 degrees. In a casserole dish or rimmed baking sheet, roast tomatoes with 2 tbsp olive oil for 30 minutes. Salt the eggplant and let sit in a colander for 15-30 minutes to remove juices. Pat dry with a paper towel. Add olive oil to a dutch oven over medium heat. Once hot, add the onions and garlic to the pot. Cook the onions, stirring occasionally, until they are wilted and lightly caramelized, about 5 to 10 minutes. Add the peppers and salt and pepper and continue to cook, stirring occasionally, about 5 minutes. Add the eggplant, zucchini, roasted tomatoes, bay leaf and thyme. Bring to a simmer and let gently simmer for about 15 minutes. Remove from heat. Add a splash of red wine vinegar and salt and pepper to taste. We served ours with whole-wheat penne and sprinkled Parmesan cheese. Super simple and delicious. We’ll definitely be making this again come Summer after we hit up a Farmer’s Market. I just came across your blog today, and I must say, I am so excited! I can’t wait to try to recreate so many of your amazing looking dishes – and deserts, heaven help me! 😉 Having said that, I was wondering if you think this meal could be thrown in a crock pot instead of using the method in your recipe? Thanks so much, Robin! Glad you stumbled upon it! Yes, you could definitely make this in a crock pot. I would cook on high for 3-4 hrs or low for 6-8 hrs. Enjoy! 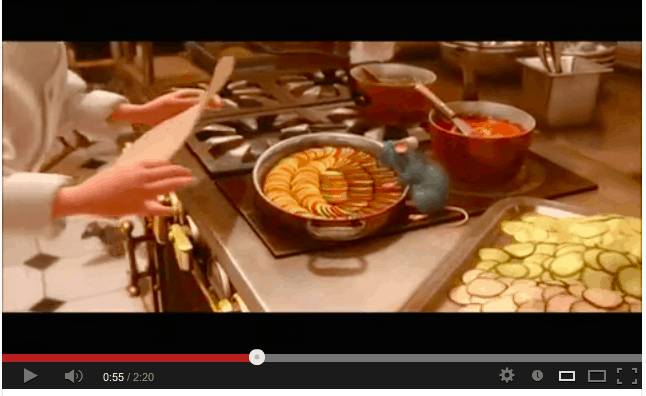 That was such a sweet movie and I don’t make Ratatouille near as much as I like so you have given me some inspiration. Love Emma’s suggestion of adding in some beans and chorizo – yum. 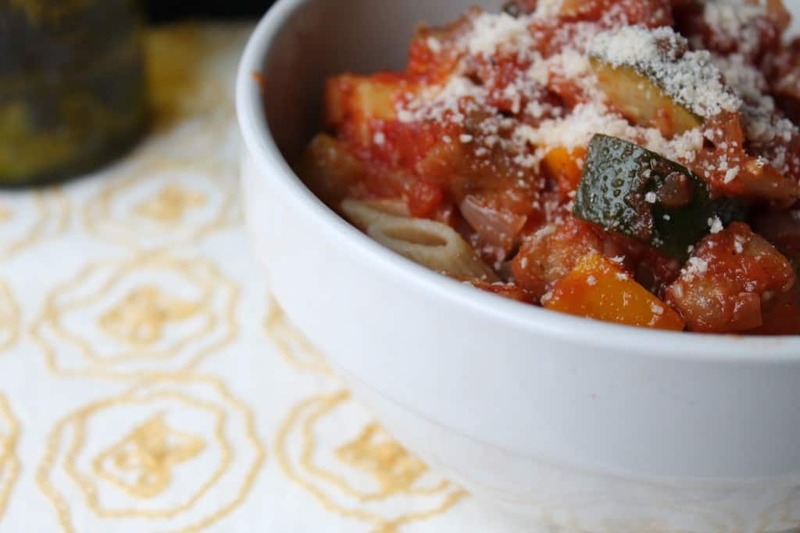 Love ratatouille Kara….I had an Aunt who would make it but used to call it Ratatoully…pronouncing the “L’s” and we would all giggle. I often whip it up as a quick side just with zucchini and the tomato. also a great base for a soup, make extra and add stock, white beans…a little chorizo if you desire….the next day. I definitely thought about this one too! Such a cute movie. I can tell you have been practicing with your DSLR 🙂 great post!